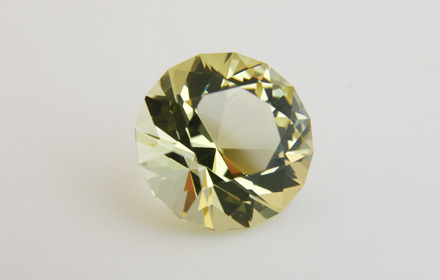 Weight: 4.16 ct; size: 10.57 | 10.56 | 7.64 mm; shape: round; colour: light greenish yellow; strong; clarity: eye clean; cut: excellent; treatment: none. Probably irradiated rock crystal. Very clean specimen; design ‘Standard Round Brilliant’, excellent cut by Tan Pen.